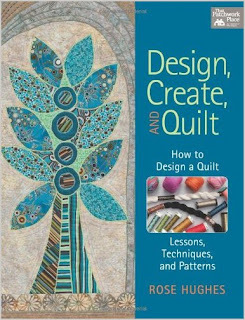 I have had the opportunity to read through Rose Hughes's Design, Create, and Quilt, published by That Patchwork Place. I've been a fan of many of their titles since I first started getting involved in fabric arts, and this current selection is no exception! Reading straight through the book gives you a basic lesson in composition, beginning with line and shape, then adding texture, color, and the use of space. Rose doesn't stop with designing though. She also covers the basic skills you'll need to create an appliqued design and to quilt and finish it. With all the techniques and encouragement to experiment contained here, this is a great first book for a new art quilter. Each chapter of design tips also has a project or two that you can customize to suit yourself, and that will allow you to practice the skills taught in that chapter. All the materials and tools needed are fully explained, and templates are provided should you wish to reproduce the sample quilts exactly. One of my favorites is pretty early in the book; Rose's Winter Mountains (shown above). I love the use of curvy and straight lines together, the bold colors, and the use of sheer fabrics to create focal points. Very pretty! As you work your way through the book, the projects get more challenging, but don't worry...all the techniques are very well described, step by step. The highlight of the techniques taught in this book is Rose's fast-piece applique method, which will allow you to add curved pieces to your designs with no need for painful traditional piecing. So simple, but so pretty! And you'll also really enjoy her tips for adding embellishments to your quilts...after all, that's what often sets a quilt apart and makes it truly yours! Thanks for the review, Cyndi. I'd buy the book just for the lovely quilted tree on the cover. I sew but have never quilted. 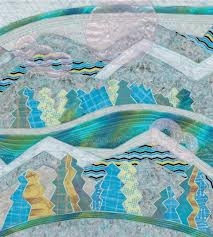 Probably I should try a quilt quilt before art quilts. I think you should try whatever appeals to you first! There is no "one great way" to construct a quilt...look around at what different artists do, and choose a style that appeals to you. Find out as much as you can about the artist's construction methods and then do a small sampler to see if you really like the method. For example, my applique method is very very different from Rose's. "Stitch and flip" piecing is very different from traditional piecing. It's just what appeals to you! Learn them all...eventually!! Eileen, I can totally see you doing an art quilt. I agree with Cyndi, do what feels right to you!